Can we give you lift? Lift them up! The Elevate™ booster seat from Munchkin is the perfect solution for transitioning from the high chair to the big kid's table. 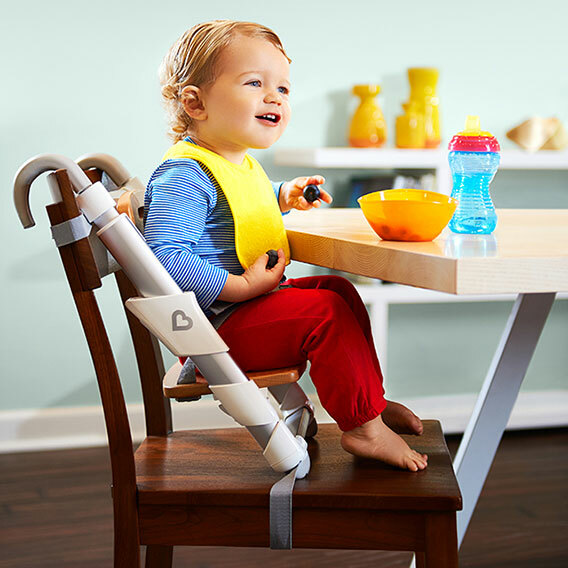 Made from sleek aluminum and wood, the compact design not only helps your toddler reach the table, but has a smaller footprint than most boosters. Installing is easy too, the sliding aluminum frame and adjustable wooden seat grow with your child. Rubberized hooks latch onto most standard size chairs ensuring a secure fit for this lightweight seat. Rest assured, your little diner can't wiggle out of the chair either with our secure 3-point harness system. Whether you choose to dine at home or fold it flat and take it on the go, mealtime is made easy with Elevate™!